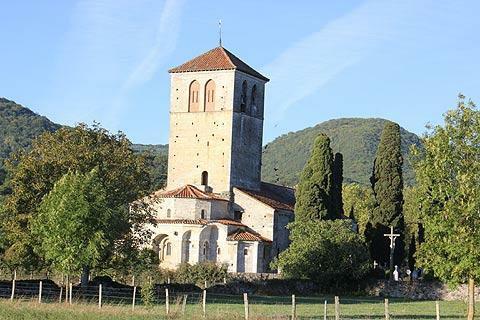 Valcabrère is a small village a short distance outside Saint-Bertrand-de-Comminges that would doubtless go unnoticed if it wasn't for the presence of the very lovely roman style Basilica of Saint-Just on the edge of the village. 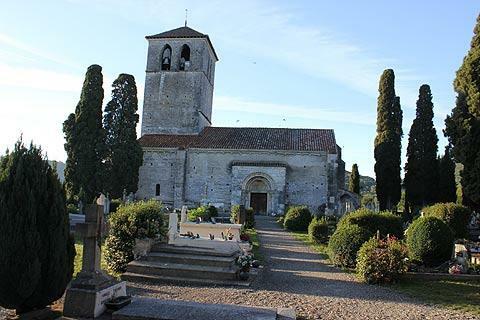 The setting of the chuch is almost as impressive as the building itself: there is a nicely maintained cemetery and some attractive trees immediately surrounding the church, with these surrounded surrounded by picturesque countryside. I visited early in the morning in Autumn when the trees had started to become autumnal and the sun was just rising and it really was very lovely. The basilica was built in the 11th and 12th centuries in the roman style and is now listed by UNESCO as a World Heritage Site as one of the important pilgrimage sites on the route to Santiago de Compostella. Before entering the graveyard look at the stone in the wall with an engraved cross, just to the left of the entrance. 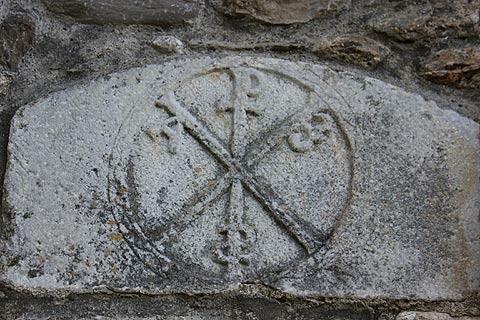 The cross is in the form of an 'X' overlapping a 'P' and is known as a chrisme*, a very early Christian symbol. * The X and P of the Chrisme represent the shorthand (first two letters) for the word 'χρηστός' and were an early Christian symbol. The other letters on the face of the cross are 'alpha' and 'omega', the first and last letters of the Greek alphabet and together symbolising 'everything' and an 'S' representing the saviour. 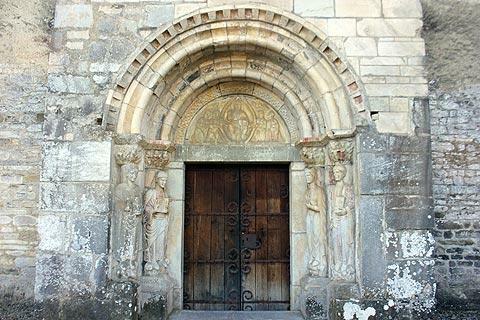 The basilica has all the elements that we usually find in a roman style church, such as the semi-circular arches of the doorway, the simple chevet to the rear of the church and the carvings around the doorway representing Christ and the saints, although the arches inset in the chevet are rather unusual and the carvings around the door are of better quality than most. The roman style continues inside, with a central nave with semi-circular stone arches leading to the central apse at the end of the church. Note that many remains of much older buildings were used in the construction of the church, including stone from a nearby Roman villa and from a 4th century sarcophagus. 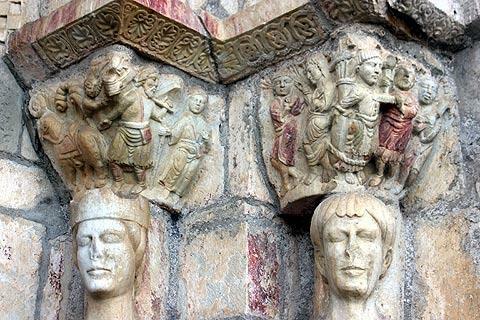 A small entrance charge is payable to visit the basilica at Valcabrere. 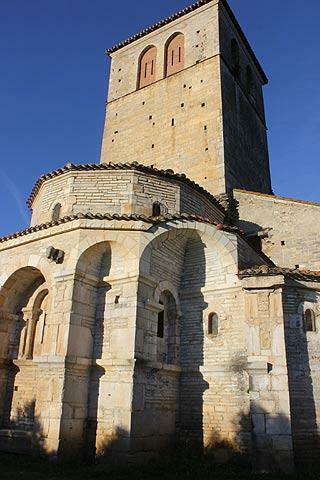 In the centre of Valcabrere village there is an unusual chapel dominated by a tower. 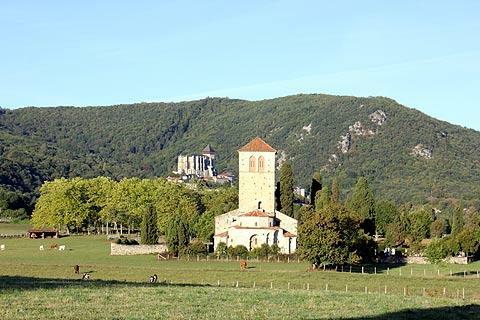 From the basilica in Valcabrere you can see the cathedral at Saint-Bertrand-de-Comminges on the hill a little way from here, and you will certainly want to visit to see both the cathedral and the village.